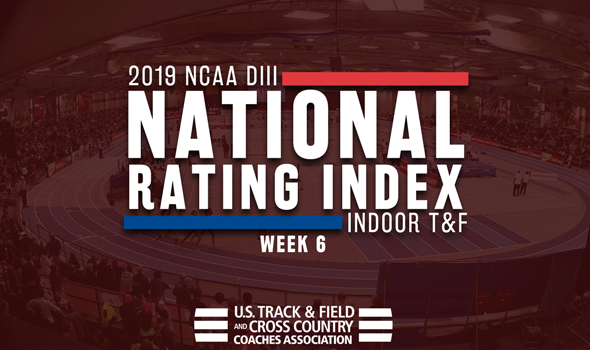 NEW ORLEANS – Let’s take a look at how much Conference Championships Weekend shifted the NCAA Division III Men’s & Women’s Indoor Track & Field National Rating Index. Only five of the top-25 teams in the Men’s TFRI and only five of the top-25 teams in the Women’s TFRI stayed in place between Week 5 and Week 6. Remember: The 2019 NCAA Division III Indoor Track & Field Championships will be held next weekend, March 8-9, at the Reggie Lewis Track & Athletic Center in Boston. North Central (Ill.) and UW-La Crosse are going toe to toe atop the Men’s TFRI. Right now the Cardinals are barely holding off the Eagles, who made a big charge this past weekend. North Central (Ill.) received a new top-5 mark nationally from Peyton Piron in the 400 (He’s now ranked No. 2), but UW-La Crosse countered with a handful of its own. The Eagles saw Andrew Jarrett launch the weight 21.22m (69-7½) to cement his spot both atop the national leaderboard and in the NCAA DIII record book. Then you have Joshua Schaeder and Seth Holden who are now ranked second and third nationally in the 3000 and 60, respectively, and Jacob Teunas, who is now ranked fourth nationally in the triple jump. UW-La Crosse’s rise knocked UW-Oshkosh down a peg to No. 3. The talented Titans have been led all season long by Ryan Powers (No. 3 in both the 200 and 400), while freshman Jonathan Wilburn just took over the national lead in the triple jump at 15.02m (49-3½). Mount Union and UW-Platteville round out the top-5 at No. 4 and No. 5, respectively. The biggest gainers in Week 6 of the Men’s TFRI were No. 67 Emory (up 63 spots), No. 29 Carnegie Mellon (up 49 spots) and No. 38 Westminster (Pa.) (up 45 spots). It’s a two-team race atop the Women’s TFRI between Washington (Mo.) and Williams. This past weekend the Bears were propelled by the efforts of Heidi Nassos, who took over the national lead in the pole vault at 3.93m (12-10¾). Nassos and teammate Julia Dannenbaum have been ranked atop the Descending Order List all season long in the event (Dannenbaum had the national lead until this past weekend and is now ranked No.2 ). The Ephs received tremendous efforts from two of their relay teams. Williams’ DMR team got the baton around in 11:50.12 (11:42.60c) to find itself ranked second nationally. Then the 4×400 relay team passed the stick in 3:53.41 (3:50.36c) to also take over the No. 2 spot nationally. George Fox is still ranked No.3 behind WashU and Williams and strengthened its spot in the TFRI. The Bruins’ 4×400 relay team clocked a time of 3:50.49 to move into third nationally. Wheaton (Ill.)’s rise continues. After being ranked as low as 38th in Week 3, the Thunder is now billed No. 4, its best ranking in program history. Favor Ezewuzie led Wheaton (Ill.) this past weekend as she notched a nation-leading time of 8.72 in the 60 hurdles and moved up to No. 3 nationally in the open 60. UW-La Crosse rounds out the top-5 of the Women’s TFRI in Week 6. The biggest gainers in Week 6 of the Women’s TFRI were No. 19 Middlebury (up 75 spots), No. 71 Shehandoah (up 66 spots) and No. 79 Swarthmore (up 49 spots).